Killer last stanza – love it! Very much like this, Janis. Feels a bit Janet Frameish, or maybe that’s because I’ve been reading her … I like the ‘shut shell’ and the unexpected casual ‘gritty bits’. Living off parakeets too… a delicious ghastly image. Thanks Mary. I’m sure our cat would live off parakeets if she could. Yes, I agree with Helen – the last stanza really kicks a punch! I love the shift in structure, ‘Thinks: ‘. It zeros it all down to essentials. Really enjoyed this!! Thanks! I made some revisions to the last 2 lines last night before I posted it – I’m pleased I made the changes now. I’ve always thought of Paekakariki as a wild place not a place for resting or purring at all,gritty bits yes …but this poem has changed all that. It now seems quite exotic. Love the contrast between the quiet violets and the emerging personality of the deserted lover. Lovely poem, Janis. 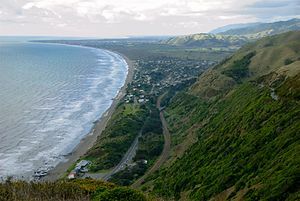 And I learnt that Paekakariki means “the ridge where the parakeets perch”. Bonus! And the phrasing throughout. One of my favourite poems this week — so good.